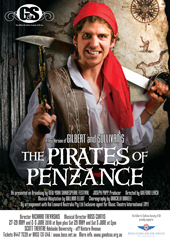 In May 2010, join the rollicking band of the Pirates of Penzance, (who will never hurt an orphan because they know what it is like!) and the dutiful Frederic, whose birthday on February 29 causes him all manner of grief, as they seek to win Major Stanley's bevy of beautiful daughters in a tale of love, larceny and leap year! The Society presents the Broadway production of this hilarious G&S classic! A must-see for the whole family!